A news report is raising health concerns over a product from an American company used by many Swiss ski resorts to boost the production of artificial snow. Denver-based company Snowmax International produces proteins that make water freeze faster and at lower temperatures. The company says its product is used by such Swiss resorts as Zermatt and Crans-Montana in the canton of Valais and Davos and Arosa in the canton of Graubünden. But SonntagsBlick reported on Sunday that Snowmax is made with a bacteria that may lead to human health problems, a claim the company denies. The newspaper noted that the product is banned in Bavaria and in Austria, while in France a moratorium on its use was introduced. 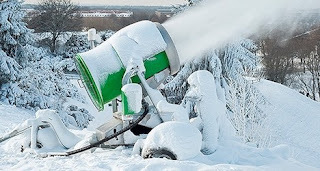 “Different studies have shown that Snowmax can have a very negative impact on human health,” Carmen de Jong, a hydrologist from the University of Strasbourg in France told the weekly. The bacteria can serve as a breeding ground for living pathogens, she said. De Jong said that ski resort staff involved with snowmaking should have the least possible exposure to the powder, which is mixed with water, and should wear protective clothing. The product is dangerous for more than 400 plant species because a “cocktail of enzymes causes the dissolution of cells”. The Swiss federal environment office approved Snowmax for use in 1997 based largely on information provided by the manufacturer. On its website, the US producer actually cites the environment office’s conclusions to explain the harmless nature of Snowmax. It quotes the office as saying that a “chemical investigation shows that the product contains no harmful substances”. The company also cites the conclusions of “Professor Richard Braun”, who it said investigated the use of Snowmax for the Swiss Biolink Institute in 1998. “Snowmax is produced from inactivated micro-organisms and is harmless to the health of humans, animals and plants,” Braun is quoted as saying. The producer says that Snomax is made from a bacterium (Pseudomonas syringae) that is commonly found on land, in water and in the air. The debate about the product’s safety may be a moot point for others, however. A spokesman from the Swiss Institute for Snow and Avalanche Research told SonntagsBlick that with modern snow-making equipment such additives are no longer necessary. The issue underscores another point, however. Around half of Swiss ski resorts rely on snow-making because they can no longer count on enough natural snow, thanks to global warming.